Flourishing ocean based industries, such as offshore exploration and production offer vast opportunities for addressing many of the big economic, social and environmental challenges expected to emerge in the years ahead. These emerging ocean industries are developing and applying a range of science and technological innovations to exploit the oceans’ resources more safely and sustainably and to make the oceans cleaner and safer as well as to protect the richness of their resources. The activities differ considerably in their stage of development: some are relatively advanced while others are still in their infancy. To bring them on stream on a scale that would allow them to contribute in a meaningful way to global prosperity, human development, natural resource management and green growth will require considerable research and development effort, investment and coherent policy support. The South East Asia offshore support vessel services market is expected to progressively recover after the oil and gas industry crisis. The vessel-to-rig ratio is also foreseen to recover with increasing utilization and day rates. By region, South East Asia followed by the Middle East & Africa region has attracted significant tonnage amount in comparison with the other regions in the global market since 2014. There are about 2160 offshore support vessels in operation in the South East Asia market, which accounts for approximately 40% share in the global OSV fleet and is followed by the MEA region, which has grown to hold a share of approximately 18% in the global OSV fleet. It has been recorded that nearly 280 vessels have moved from other regions into the Middle East and Africa region, primarily due to the increasing E&P in the shallow water fields. This has also intensified the competition for jobs created by the movement of these foreign vessels. 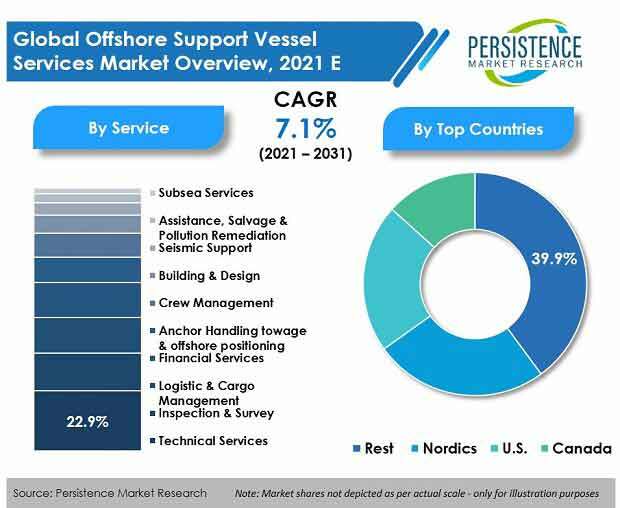 Owing to favorable macro-economic factors in the OSV market in Europe, it is estimated that new building requirements will be on the rise even though the growth rate is relatively low. The growth in this market can be attributed to the swelling demand for transport along with supply side factors such as the rapidly increasing consumption of oil and gas as well as the deployment of newer and more efficient equipment and technologies. Fleet digitalization is offering new horizons of possibilities for the fleet to become more effective, transparent, responsive and punctual in operations. However, due to overcapacity in terms of global shipbuilding and transport, these demand scenarios for growth are not enough to restore balance to the ongoing health of the overall maritime industry. Much has already been done for reducing this capacity, but it still falls short and risks continue to remain high. The OSV production in recent years has fallen down as the demand for OSVs is driven by the production support, rig support and to some extent, offshore and subsea construction support.